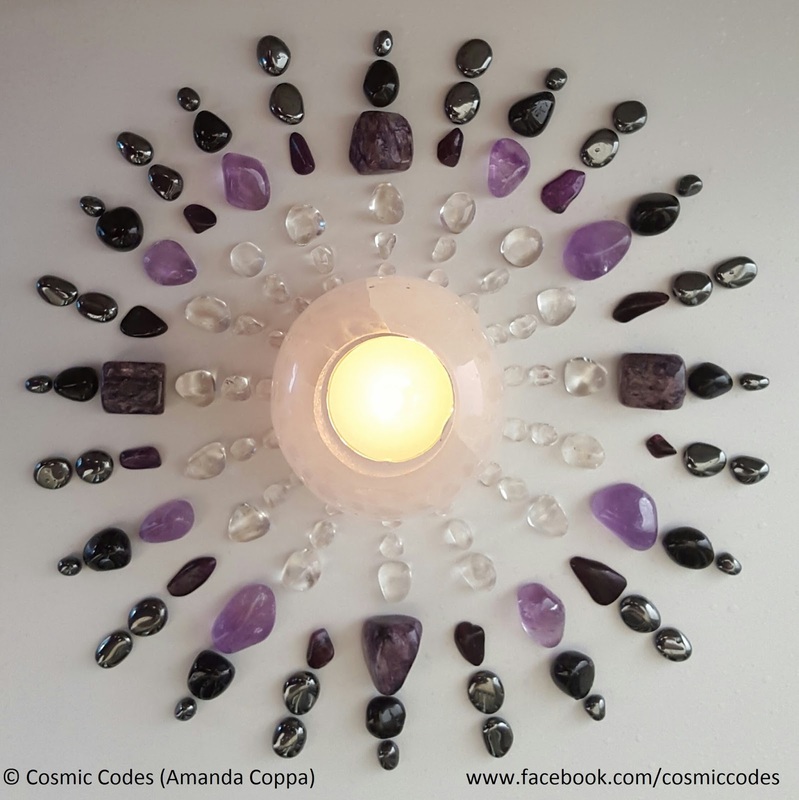 Amanda Coppa is a heart-centred crystal healer who incorporates astrology, numerology, Reiki and oracle cards into her work. 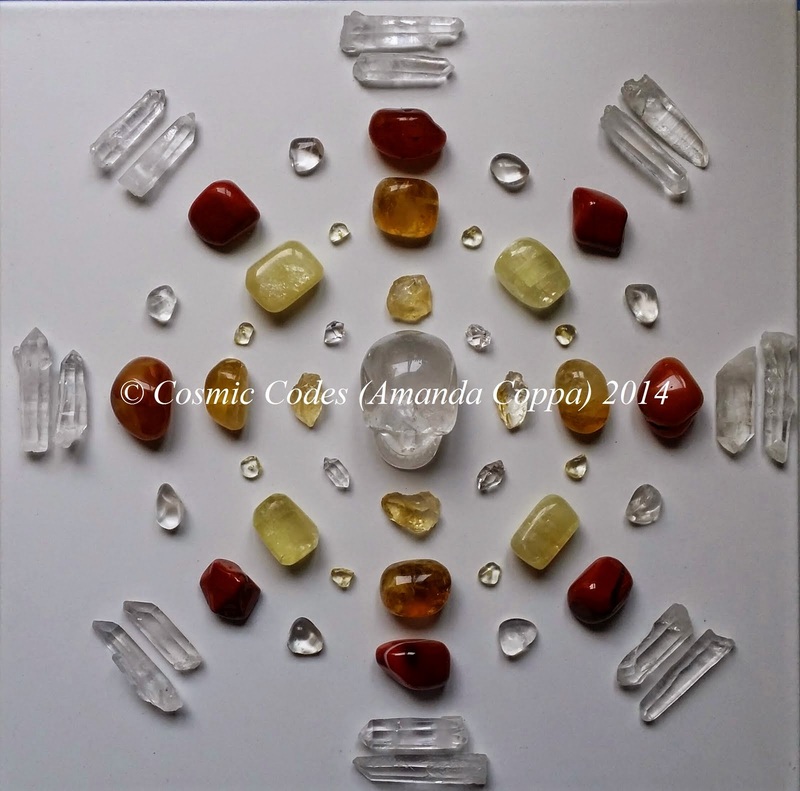 She is passionate about self-healing, empowerment and helping you understand the REAL you. At 9:02pm AEST Monday 20 June the Moon will be at her peak in the sign of Sagittarius. Sagittarius is a mutable fire sign which is ruled by Jupiter our largest planet. This full moon is another strong one and is amplifying our sensitivity to the energies around us. This is the second of two full moons in Sagittarius (22 May & 20 June) and also happens to be my own personal moon. The sign of Sagittarius is restless in energy and with this full moon coming around again, it reinforces the importance of us working closely with it and not overlooking the opportunity. The highest ideal for Sagittarius is the search for truth, purpose and meaning in the adventure of life. Each of us are being guided to this point now. The path to enlightenment is an inner journey of self-discovery and remembering who we really are. This is a time to pause, listen and be aware. To retreat and find seclusion to assist us in connecting with our Soul / inner truth and stripping away illusion. We are reminded to follow our heart path and to keep our gaze on the horizon, yet our vision open to what is around us. Each of us has a unique & sacred purpose, and our life is rich with meaning already…are you noticing? 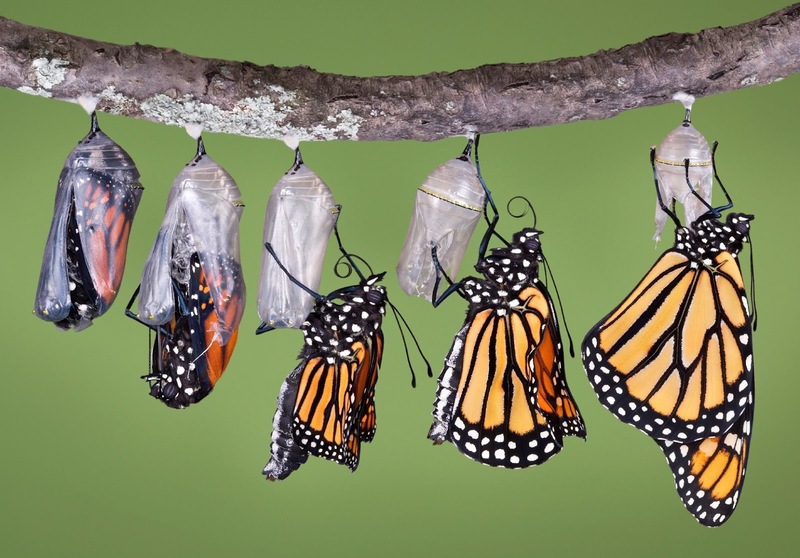 As we allow ourselves to search internally rather than externally we will indeed transform our life for the better. 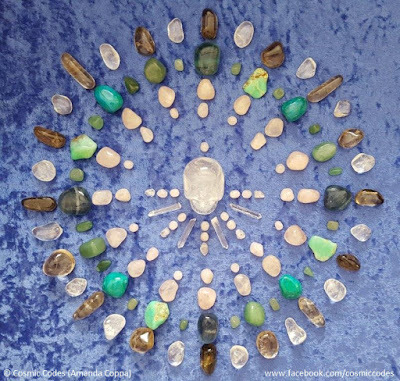 This grid was created with a selenite candle holder in the centre representing our inner light and reminding us to shine proudly & brightly. It is surrounded by clear quartz (energy), Sugilite (Violet Flame / Divine love), Charoite (service to the Light), Hematite (grounding) and Black Tourmaline (protection) for us sensitive souls who are feeling the energy so deeply at this time. Take a deep breath, relax and allow this grid to help you surrender the past and illuminate your life & your unique path. 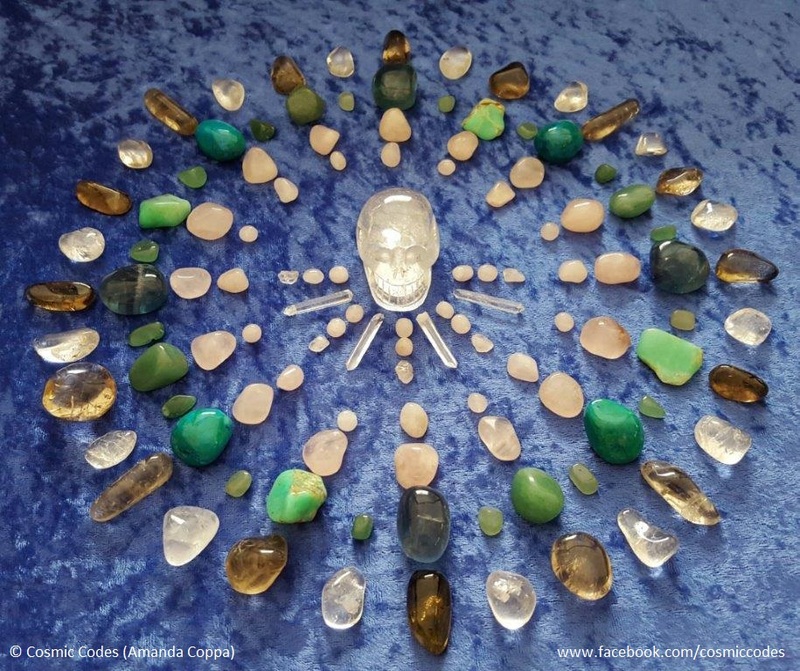 Crystal Healing Sessions by appointment only. 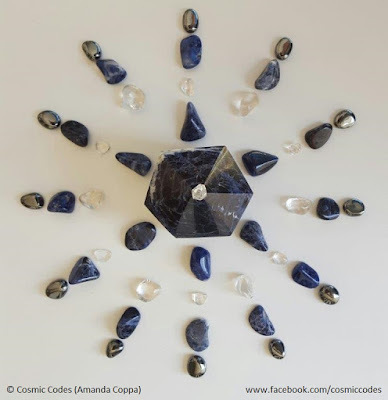 "I AM CLEAR, FOCUSED AND TRUST IN THE FLOW OF LIFE"
This grid has been created with Sodalite, Clear Quartz, Hematite and the cutest little Herkimer Diamond perched on top. On Tuesday 23 February at 5:19am AEST the full moon in Virgo will be at her peak. The sign of Virgo is practical, analytical and conscientious with a desire to understand and be of service. 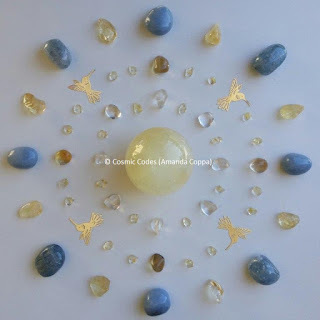 Virgo energy is primarily concerned with health matters, work, self-improvement & daily routines, and these areas will be activated in our life at this time. As a mutable earth sign ruled by the planet Mercury (communication & expression), Virgo is more adaptable and expressive than the other earth signs (Capricorn and Taurus) and its influence will have a stabilising effect on the shifting energies of the Moon. The keyword for Virgo is ‘I ANALYSE’ and this Full Moon highlights our ability to think rationally and assess situations from a practical perspective. It will bring new insights and solutions to old problems which can help us to move forward with greater ease and clarity. Our mental attitude will be a key component for allowing change to occur with grace, flow and ease. Our mind, and indeed our thoughts are a powerful tool for healing and manifestation so we must direct it consciously. The Full Moon marks a time of RELEASE AND CLOSURE. When in Virgo it’s a golden opportunity to PAUSE AND FOCUS on those aspects of our life that need our time and attention. It’s so easy to overlook things when our daily life is so busy, yet now we are guided to bring our attention back to where it is most needed now. We can use this time to ‘clean up our act’ if we’ve allowed our schedule to become lopsided or have lost focus. Self-care & nourishing, adequate rest and good diet will also help for optimal functioning. This is the time to reflect, to turn inwards and really LISTEN to our feelings, thoughts and emotions. 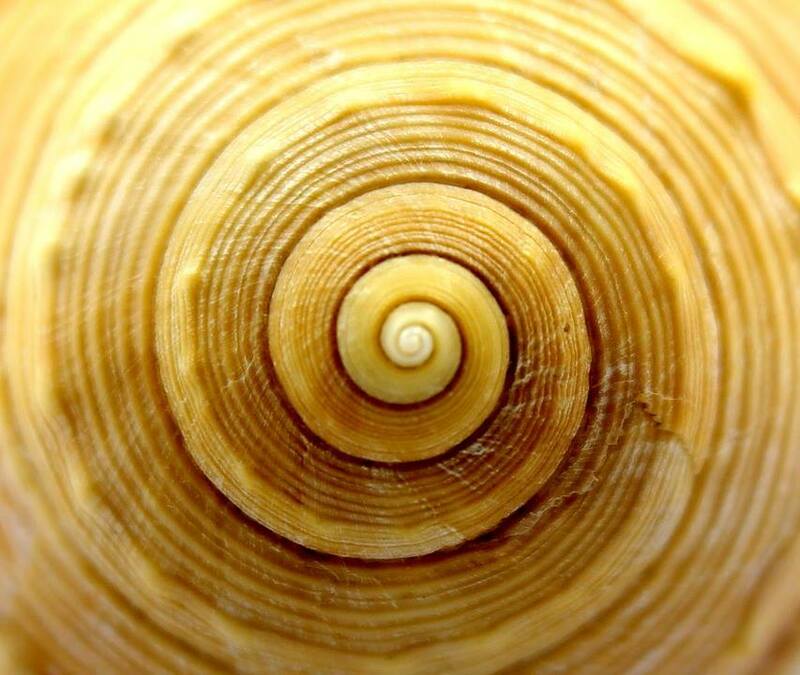 What are you feeling or experiencing right now in this moment? Perhaps you can take it a step further and use this time to dialogue with your physical body. Ask a question and notice the subtle (or not so subtle) responses you receive from it. Do your best not to judge what you receive, simply notice it and bring your awareness back to you. This can be a wonderful way to receive valuable insight into how your body is functioning and allows you to take control of your health and wellbeing. Really listening to the body and taking appropriate action steps when guided will help to kick start our metabolism or revitalise lagging energy. Good health and well-being really does start with you! The full moon in Virgo ushers in a time of emotional SPRING CLEANING and reminds us not to let life’s chores, responsibilities or burdens keep us from living the life we are truly meant to. There is a strong HEALING theme to this moon phase, as we cast off the wounds of the past so we can move forward with renewed clarity. We are our own healer and we have the ability to create healing miracles right now! Expressing our true feelings and deeper emotions under the full moon (from a place of love and understanding not fear) can also help us to release any pain, wounds or fears and this in itself initiates the healing process. You may be guided to exercise, improve your diet or simply rest more under the Full Moon. Whatever it is, take positive action when guided and watch your situation improve. If you require additional support and healing at this time please connect with the energies of these crystal grids or call on ARCHANGEL RAPHAEL to assist you in any way you require and HE WILL. Archangel Raphael reminds us that as we focus our attention on healing, balancing and restoring ourselves WE CREATE PATHWAYS TO HEAL, balance and restore others. So on this Full Moon avoid falling into old patterns, instead surrender what no longer serves you and watch your life improve! Healing affirmation: “It’s only a thought, and a thought can be changed” ~ Louise Hay. At 8:44am AEST Thursday 26 the full moon will be at her peak in the mutable air sign of Gemini. The sign of Gemini is ruled by the planet Mercury and covers matters relating to communication, self-expression, information and friendships. The full moon in Gemini reminds us to pay attention to our self-talk, the way we communicate with others and our attitude. There is a strong sense of RELEASE with this moon which will bring things to a head for us so that we can let go of the thoughts, memories and behaviours that hold us back. This message came through for us today…..
Tonight take time out for YOU under the full moon. Sit in a quiet and relaxed state of readiness and RELEASE what no longer serves you. 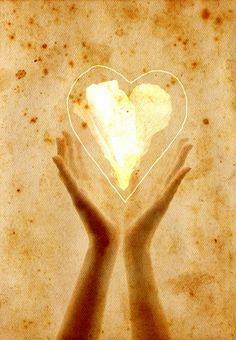 Open your heart to receive the messages that are indeed answers to your prayer. “The heart is the place where truth and compassion reside, and the throat is the place from which these qualities emerge through our communication.” Robert Simmons. Wishes are coming true for many Lightworkers on the planet. Divine timing is in play, a portal of light is opening now and we ask that you offer your prayers, hopes and wishes so they can manifest. It’s time to be crystal clear with your intentions. We ask that you look beyond the surface and what you see with your two eyes, and tune into the truth through your third eye. All is unfolding perfectly. You must now step up and take responsibility for the part you play in walking your earthly path. Bring your awareness to that which your heart wants and to that which makes you feel alive. Be proud of who you are and all that you do. 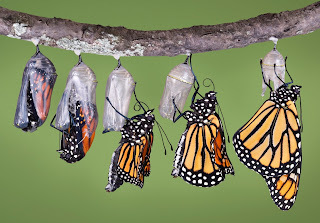 It’s time for the butterfly you are to emerge from the cocoon and emerge you will. Feeling so proud and immensely grateful for an opportunity to expand and grow in new ways. Today I did a crystal healing and reading on a wonderful lady who was completely deaf and couldn’t talk. Initially I was worried how I would do this seeing as though much of my work involves talking and sound. Sure I could write it (and for some of it I did) but I also knew I would have to rely more heavily on my other senses. It would be a challenge (but one that I was really excited by) and I’d need to think on my feet. Not speaking and with only vibrational sound and energies we were immediately eased into a space of deep peace. My healing room seemed to fill with love as I held space for this woman who wanted nothing more than to feel love, peace, acceptance and understanding. My logical mind switched off and my heart switched on. Her resilience and strength shone through along with her tenacity to thrive in a world without sound, something most of us take for granted. Being allowed access into her world for a short time gave me a far greater perspective of my own. ♡ Even when the road ahead is unclear, if we open our heart and trust we will be guided in the perfect way every time. ♡ In those moments when you ‘think’ you can’t, open your heart and ‘trust’ you can. ♡ Every experience holds an opportunity for us to both teach and learn. ♡ Love truly is all it takes to conquer doubt, fear or feeling small. ♡ One simple act of kindness can create ripple effects that move mountains. ♡ We are all capable of so much more than we give ourselves credit for. ♡ Taking a little extra time and care with those who need it most bridges even the widest gaps. Sending love and peace to one and all.